If you need more speed or memory, consider adding the Compute Booster to scale up to 6 Intel Xeon Cores, and 12GB of memory anytime you want. 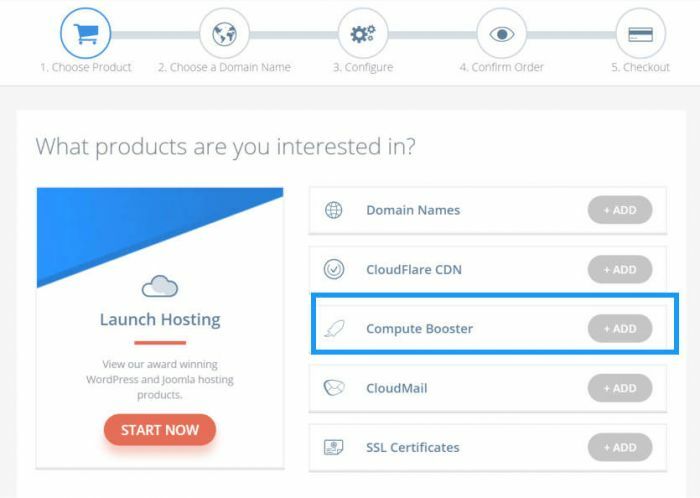 To add the Compute Booster to your hosting & support package, simply log into your Cloud Control Panel™(CCP), click on the "New Product" button. Once inside the shopping cart, click on the Add+ button for "Compute Booster"
In the next window, click on "Compute Booster". In the next window, select the level of Compute Booster that you would like to add. Each level incrementally raises the CPU and RAM allocated to your site. In the next screen you'll be asked whether you would like to purchase the Compute Booster on a Monthly or Yearly basis. You will also need to select the site in which you would like to add Compute Booster. Once a site has Compute Booster applied to it, you will see a new tab in your Cloud Control Panel. Select the "Manage" button for the Compute Boosted site that you would like to modify/review. You will then be provided the option to view resources, upgrade/downgrade and request the cancellation of the Compute Booster product.